A new service for patients enrolled with a family doctor at our clinic. Please refer to the following guide in order to set up and operate your portal. As new features are added, we will update this page. Please note that the patient portal is a free service to all of our patients. Once you've opened the link for the patient portal, this is what you will see on your screen. If you haven't created an account yet, you need to click the button to register. Before doing so, ensure that you have chosen your desired language in the top-right corner. Note that you can change the language at any point during your registration. On the registration page, you will be asked to enter your personal information. The sections with a red asterisk (*) are mandatory. Once you are done, please ensure to 1) Open the terms and conditions. Please note that they are currently only available in French and are in the process of being translated. 2) Once you've opened and read the terms and conditions, you may now click in the box to confirm that you've done so. 3) Click register. At this moment, the system will send you an e-mail to confirm that your e-mail address is correct and in this e-mail you should click on the link in BLUE in order to activate your account. Once you've activated your portal (by clicking on the link that you received in your e-mail after entering your information) you now have access to your portal at any time. To get to the portal on a regular basis, visit the address https://jardins.portail.medfarsolutions.com. The image above is what you will see when you log in to your portal. To log in, simply enter your e-mail address and the password you created. We advise you to create a bookmark for the portal website in your browser to create easy access for yourself. 1) Attached profiles: This should indicate the name(s) of the person or people that will be using your portal. Please advise us if there are any attached profiles that are not your own. If you are two or more attached profiles, you can change which profile you'd like to view by clicking on the different names. You must give us permission in order to link two or more profiles to the same portal, as all members will have access to each other's confidential information. 2) Language: Click here to change your language whenever you please. 3) Profile: Click here to modify or view your personal information. 4) Appointments: Click here to make an appointment or view appointment history. 5) Billing: Click here to view any bills you've paid to the clinic (such as transport fees or photocopy fees). Please note that bills paid prior to May 2018 will not appear here. 6) Documents: Click here to access documents that you have requested. If you wish you receive a document, please make your request in person (such as on the day of your appointment) or by e-mail: jardinsportail@gmail.com. Your doctor must approve the document before it is sent to you. Please note that some documents may not be available to you until you have consulted with your doctor. 7) Logout: As indicated in the terms and conditions, you are responsible for any confidential information in the portal. It is imperative that you log out of the portal when you are finished or when leaving your computer unattended. Features that are currently unavailable: Messages and Dossier. 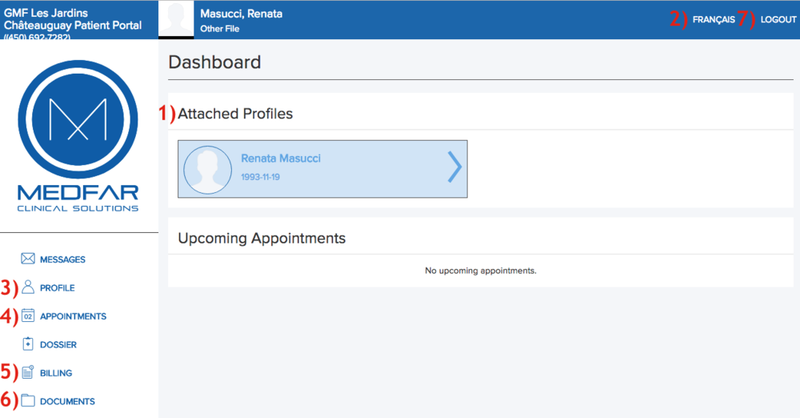 To make an appointment, click on appointments in the menu on the left of your screen. The above image is what you will see on your screen. 1) Book an appointment: This is where you will book an appointment with your family doctor. You must choose between the various appointment types based on your needs (for example: annual exam, follow-up, or emergency appointment within 72 hours). 2) Emergency appointment: This feature is unavailable for now. Eventually you will be able to make appointments for the emergency here. For the time being, if you have a family doctor at the clinic, simply call us at 450-692-7282 ext. 301 to book an emergency appointment with one of our family doctors. 3) Appointment history: Here is where you can see past appointments. If it is red, it means it was cancelled. Please note that some appointments before 2016 might not appear. 4) Upcoming appointments: Once you've made an appointment in the portal, you will see your appointment date and time here. For any questions in regards to the patient portal, please call 450-692-7282 ext. 263. If there is no answer, leave a detailed message including your name, phone number, and your question.